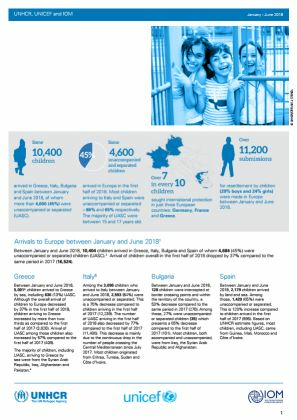 Some 10,400 children arrived in Greece, Italy, Bulgaria and Spain between January and June 2018, of whom more than 4,600 (45%) were unaccompanied and separated (UASC). Most children arriving to Italy and Spain were unaccompanied and separated 86% and 65% respectively. The majority of UASC were between 15 and 17 years old. Over 7 in every 10 children sought international protection in just three European countries: Germany, France and Greece. Over 11,200 submissions for resettlement by children (29% boys and 24% girls) were made in Europe between January and June 2018.